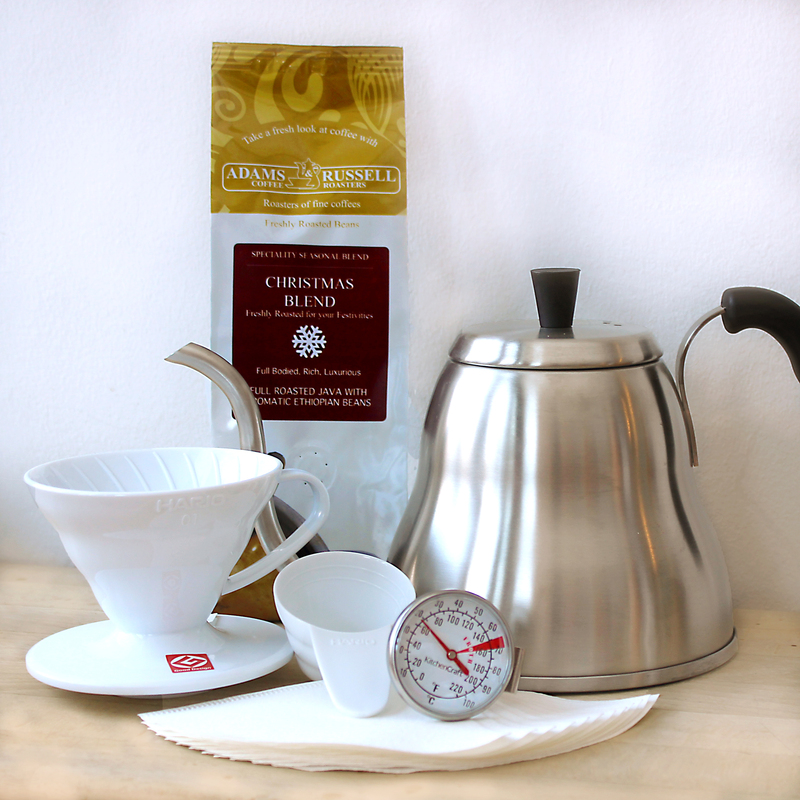 Our pour over V60 set is a great way to brew high quality coffee at home. It has become very popular amongst coffee lovers, as it creates a delicious beverage that you would expect from a top cafe every single time. Our gift set contains one long spouted steel pour kettle, one Hario V60 coffee dripper, filter papers and one free bag of our exclusive coffee of the month. We give you everything you need to make the perfect coffee! Yes, this process may be a little extra work than instant, but the results are definitely worth it. We are going to talk you through the benefits of this brewing method, the tricky coffee to water ratio and a step by step guide on how exactly to do it at home. Fold your paper filter along the seam and put into the cone of your dripper, which should be sitting on the cup. Pour hot water through the filter to rinse it. Place coffee in filter and gently shake level. Place V60 and cup on scales. Pour in 50g of just below boiling water. After 30 seconds, pour in 100g of water. After 60 seconds, pour in another 50g of water. After 90 seconds, pour another 50g of water. Now wait until your drip is finished, it should take around 2-3 minutes. The main advantage of this method of brewing is the sheer quality of coffee you will get in your cup. When reading our method instructions, you may have thought that the time intervals were unnecessary, however it is vital to the quality of the results. The slower you pour, the more time is allowed for the water to pull out all of the complex, delicious flavours from the coffee, meaning a richer and bolder beverage. Another benefit of this method is that it is a very easy set up, and no electricity is required except for heating up your water. No high tech expensive coffee machines. It is also very easy to clean, unlike most other complicated coffee gadgets. Use fresh coffee. A lot of retailers sell old beans, which can go stale quickly. At Adams and Russell we roast all of our beans ourselves and only sell high quality fresh coffee. This will make a big difference to the taste of your drink. Use fresh water. Not only does fresh water taste so much better than re-boiled water, it is also much better for your health as old kettle water has been shown to contain dissolved gases and minerals that become more toxic when re-boiled. Good quality equipment. A cheap V60 dripper made from cheap material will not last long as could affect the taste of your coffee. 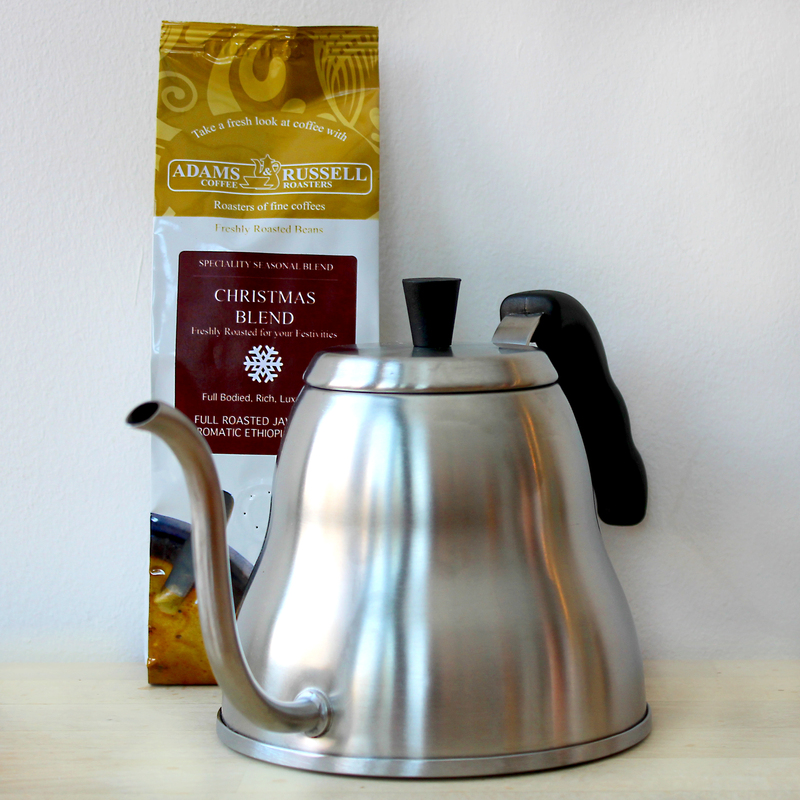 Our V60 Dripper Gift Set is high quality guaranteed and will give you exceptional results. V60 Dripper for Iced Coffee? If you do purchase this gift set we highly recommend trying it with iced coffee. It is so delicious and a great way to switch things up! It is fun to play with flavours when making iced coffee, we recommend just experimenting until you find what suits your preferences.